U.S. Army PHILLIPS Automatic Pistol, Experimental, caliber .45 ACP, manufactured by Springfield Armory. 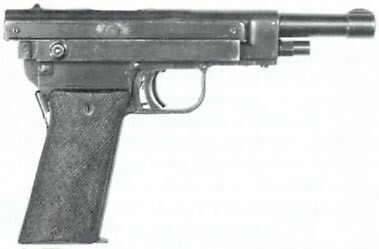 Gas-operated, semi-automatic pistol with box magazine feed; work on the weapon ceased with adoption of M1911. Designed by Major William A. Phillips of the Ordnance Department. Exhibit label: "PHILLIPS .45 caliber, 1911-1912, experimental. Developed at Springfield Armory, the Phillips was a gas-operated automatic pistol. After testing at the armory it was determined that the design was too complex for regular service use". Notes: "In the preliminary examination of this pistol and finally in an attempt to fire it, it was found that the ejector was too long to allow the cartridges in the magazine to rise sufficiently to be pushed into the chamber by the bolt. The ejector was then shortened by cutting off .27" from the forward end, when the pistol functioned properly, using dummy cartridges. Firing with ball cartridges was then commenced, and on the first shot the pistol functioned properly; on the second, third and fourth shots the cartridges were ejected, but the pistol failed to load; on the fifth shot the pistol function properly; the sixth shot failed to eject; seventh round failed to load; eight, ninth and tenth rounds failed to eject, but the eleventh and twelfth rounds were fired satisfactorily. During the firing, the regulator was changed so as to allow more gas to enter the cylinder. When the thirteenth round was fired, the 'bolt return pin screw' was shot to the rear and struck the operator over the eye. The 'locking pin unlock' was broken in two pieces and the piece was also broken off the locking block. Firing was discontinued. With the model, the pistol cannot be cocked without withdrawing the block. It is also believed that the ejector is not sufficiently strong for its purpose. It is noted... that the ejector failed to functioned satisfactorily at Frankford Arsenal and that the drawings have been changed to overcome some of the defects in this model. It is thought that the pistol has many desirable features, but that the parts in rear of the chamber should be made lighter and some so combined as to eliminate many of the screws in the present model." - Colonel Blunt Efforts continued to work out some of the design problems but after several months the project was discontinued. References: Ezell, Edward C. HANDGUNS OF THE WORLD. Stackpole Books. Harrisburg, Pa. 1981. Meadows, Edward Scott. U.S. MILITARY AUTOMATIC PISTOLS 1894-1920. Richard Ellis Publication, Inc. Moline, Il. 1993.